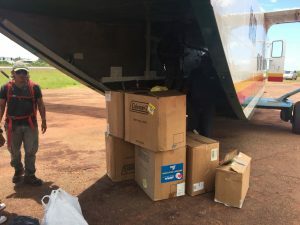 The Guyana Defence Force’s SkyVan with relief supplies it transported to flood-hit Lethem on July 6, 2018. As more residents of Lethem evacuated to emergency shelters due to severe flood caused by heavy rainfall, the Civil Defence Commission (CDC) rushed supplies to the affected Rupununi area. Director-General of the CDC, Col. Kester Craig said 59 persons were now housed in three shelters, up from 25 on Thursday. Water purification tablets, blackets, sanitation supplies, pillows, collapsible water bottles, and roll mats were delivered to the Region Nine (Upper Takatu-Upper Essequibo) administration to distribute to the shelters and the affected population, he said. The items were transported by a Guyana Defence Force SkyVan to the southern Guyanese town near the border with Brazil. Government recently allocated more money to purchase two Skyvans and two Britten-Norman Islanders to assist with Defence Force troop lift, search and rescue and emergency response. Craig added that avation fuel was deliver for Remote Area Medical Services (RAMS) to provide medical evacuations if the need arises since roads are still impassable to some communities. He praised the Region Nine administration for its response to the flood. “Overall the Regional Democratic Council is managing the situation well and keeping us informed”. The CDC said all agencies including the Guyana Police Force and the Guyana Defence Force were “working together to bring relief to the affected”.